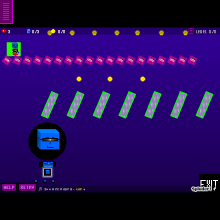 HERE COMES AN EPIC GAME CALLED 'RUNNING DEKKS'.....FOR THE FIRST TIME EVER ON SPLODER 'MAYBE' , YOU PLAY AS THE GAMER ITSELF.....RUN AS FAST AS YOU CAN, SOLVE AND ESCAPE A COMPUTER WORLD, DEKKS IS TRAPPED IN.... PLAY IT!! IT HAS GOT CREATIVITY AND PHYSICS....AN ENJOYABLE GAME. ENJOY! VOTE! AND COMMENT!